Before I discuss today’s topic, I just wanted to quickly mention the good news for anyone that is currently unaware. Chet from the CRPG Addict has decided to take up his sword and shield to fight the good fight once again! You can go visit his blog to read all about his reasons for returning, but I for one am delighted that he’s back. I don’t at all see it as a negative that there are other blogs out there doing a similar thing to what I am, particularly as each of us is taking a different approach and following different genres. There’s a growing community that enjoy this type of thing and some individuals will make their selection based on writing style or genre interests, but there’s also a lot of crossover and potential to help each other out. Exciting times if you ask me (which you didn’t)! It’s important to note with this category, that my rating will be based on the puzzles and solutions I experienced with the characters I selected at the beginning of the game. If I’d selected different characters, I assume I would have experienced similar puzzles, but the solutions would likely have been very different. This is impressive in itself, but the fact that a large majority of the ones I did experience were both logical in nature and highly satisfying in their resolution makes the game a phenomenon for its time. While I was playing, I eventually had to take notes about all the outstanding things that I felt might need to be done. If I couldn’t resolve something, I’d simply look at the list and focus on another puzzle, and most of the time solving the latter would lead to an item that might help with the former. I think there were only two occasions where I got stuck entirely and they were, as expected, right near the end of the game when there was little left to be done. 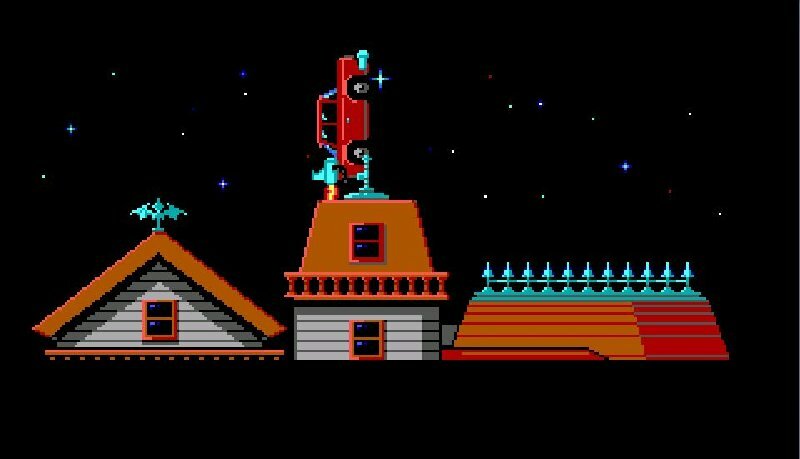 Maniac Mansion was never a chore a play and I never felt that the solution to a puzzle was illogical. The only complaint I have is around clarity, which I feel was occasionally lacking due to some items only being relevant to certain characters and the interface allowing resolutions despite the commands I used not actually being correct. The first flaw lead to me spending quite a bit of time trying to do stuff with the easel and the developer which I now assume I was never going to be able to do with the characters I’d selected, and the second resulted in more than one occasion where I was misled into thinking I’d resolved a puzzle one way, only for my assumption to be incorrect. I still don't know what that circle represents. Anyone? 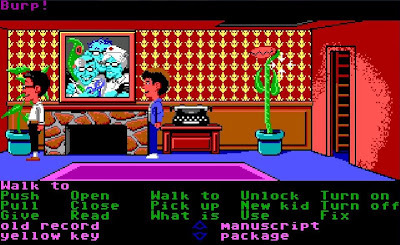 I probably don’t really need to tell you that the introduction of the SCUMM interface was hugely influential to the adventure genre as a whole. Not only did it begin the downward spiral for text based adventure games (they’d still be around for a few years yet mind you), it also opened up the genre to a much wider audience. Simply put, more people were willing to use their brains to solve puzzles when the interface was slick and easy to us, and it certainly helped that it was entirely driven by the mouse. 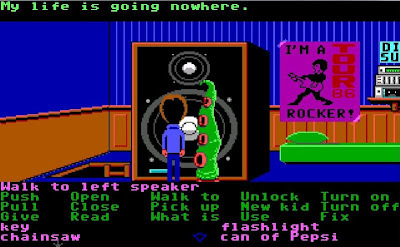 Of course, despite what many websites will try to tell you, Maniac Mansion was not the first game to try this sort of interface. ICOM’s MacVenture games (such as Déjà vu and Uninvited) were 99% driven by the mouse and Tass Times in Tonetown actually gave the player the option of using action buttons or a text interface, but none of these felt quite right for various reasons. Maniac Mansion’s brilliance is the way it allows you to form sentence structures in any order (click the verb, then the item or vice versa) and then action them when you’re happy that the game understands what you’re trying to achieve. Intuitive and simple, yet ground-breaking and highly influential! The inventory is also more than adequate, which is great considering the player needs to take care of three characters throughout. You can swap items between their inventories easily, and the developers were smart enough not to limit the amount of items that can be carried in each or to fit the entire contents on the screen at once. It can be a nuisance scrolling up and down the inventory trying to find an item, but the alternatives are much worse! Push, Pull, Open, Close, Turn On, Turn Off...this interface would have really worked in Leisure Suit Larry! This is definitely an area where Maniac Mansion failed to raise the bar. Story was always going to be a challenge when there are so many different pathways through the game, and Gilbert and Winnick pretty much sacrificed having a satisfying plot when they decided to have branching storylines and multiple characters. The game doesn’t make it very clear who the family are that inhabit the house, what have happened to them to make them so hostile, or why they’ve kidnapped Sandy in the first place. It just throws the player into the Mansion and gives them the task of saving her. Even the manual is pretty lacking when it comes to backstory or motives. You might be able to tell from my posts that I really didn’t know that the meteor was totally behind things until the very end, and I don’t think it was intended as a twist. I just didn’t get it to be honest! Somehow the lack of lucid plot didn’t really affect my enjoyment of the game, as while the occurrences leading up to my arrival at the mansion were not particularly clear, my focus and direction once inside pretty much always were. The previous highest rated games from a sound and graphics point of view were all Sierra games. 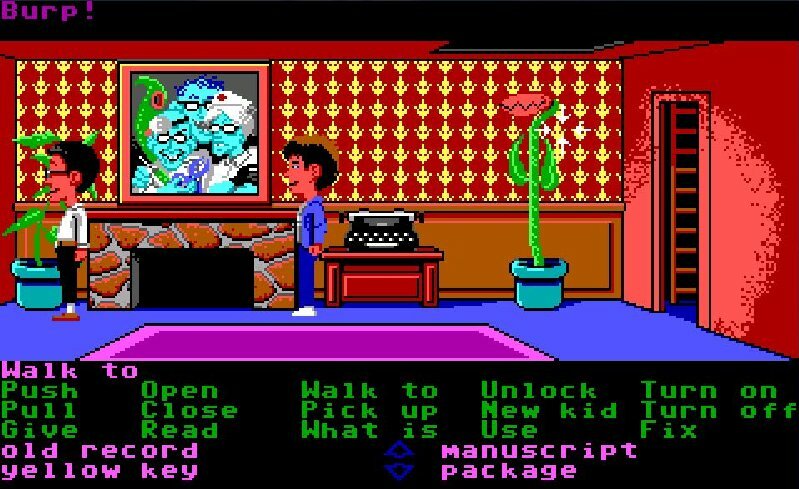 A quick comparison between the graphics of Maniac Mansion and those games (in particular Leisure Suit Larry, Space Quest and King’s Quest III) results in a no contest. It’s difficult to pinpoint exactly why, but the increase in scale for both characters and items really makes a positive difference, even though everyone’s heads are way out of proportion to their bodies as a result. The artwork detail has only slightly been increased over previous efforts but the range and brightness of the colours is much easier on the eye. 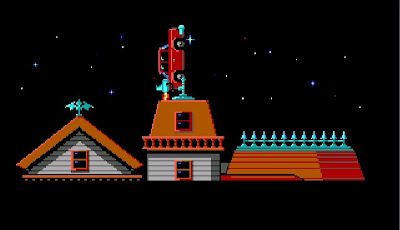 Compared to today’s graphics standards, Maniac Mansion is still fairly primitive, but it deserves some credit for what it managed for the time. The sound also has a slight increase in quality (and by that I mean actual sound quality, not the quality of the effects or music itself), but there is so little of it in the game that it’s hardly worth mentioning. Music is only used for the title song and sound effects are limited to ticking clocks, radio fuzz and the occasional opening door. I’m going to give the game a 7 for this category for upping the ante in the visual department, but a game of a similar standard in the future won’t be treated as generously, especially if it makes such minimal effort in the sound department. Note: I've since adjusted this to a 5 after readers rightfully commented that I was playing the enhanced edition, therefore unfairly comparing the graphics of a game released in 1989 with games released in and prior to 1987. A car being rocket propelled into space. Your argument is invalid! The first thing to say for this category is that the atmosphere really does suffer due to the aforementioned lack of sound. The mansion is reasonably atmospheric due to the b-grade horror staples such as bloody handprints, mummified corpse in the bathtub, and radioactive slime, but the steady silence deadens the majority of the effect these might otherwise have had. I never thought I’d talk about Uninvited in a positive light, but at least that game tried to keep the player on edge through the constant threat of death and creepy sound effects (that were admittedly pretty awful). 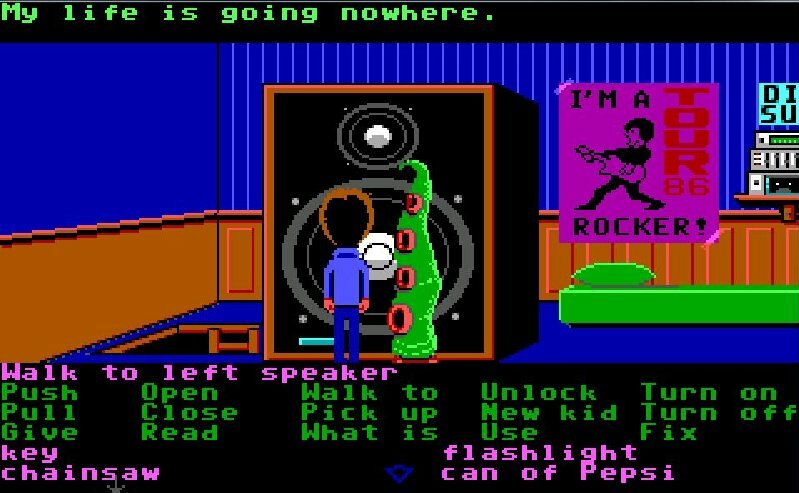 I ended up playing music throughout my Maniac Mansion sessions, only tuning in when a sound effect in the game caught my attention. As for the mansion itself, well despite the fact that Maniac Mansion is basically a haunted house game, once you realise that the house inhabitants don’t actually offer much threat (unless you really push them), it’s just a matter of getting on with your business and getting out of the way on the rare occasion that one of your actions causes Dr Fred, Nurse Edna or Weird Ed to come out of their rooms. It’s not like the developers were attempting to creep the player out though, so I won’t be too harsh on the game for the atmospheric deficiencies. Scenes like this one would have been a lot more effective with creepy sounds. What Maniac Mansion does have over the likes of Uninvited is humour. It’s not as constant or hilarious as Space Quest or Leisure Suit Larry, and most of the humour comes from the various cut-scenes, particularly those involving Dr Fred’s Dr Evil style complaining about the constant interruptions and lack of budget he has to take over the world. The rest of the amusement comes from the sheer ludicrousness of what’s going on, including a depressed tentacle and intergalactic meteor police. The dialogue itself merely gets the job done, always taking the most minimal path to keep the player focussed on the tasks at hand while injecting enough humour to be enjoyable. 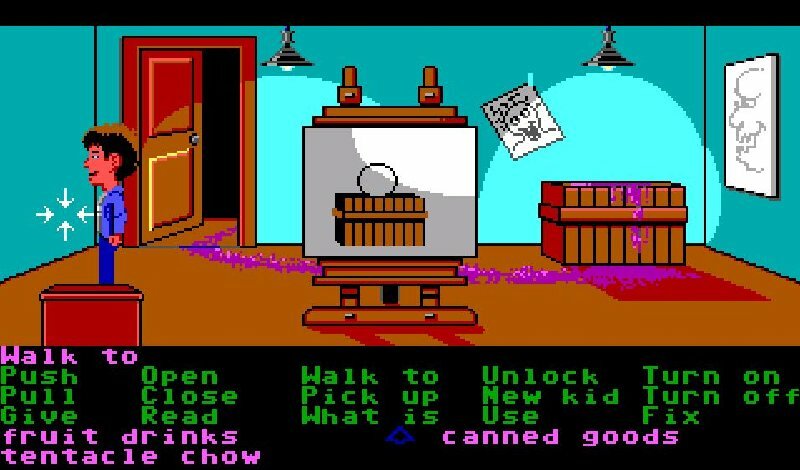 Despite all of Maniac Mansion’s advances, there’s still no way for the characters to communicate with either each other or the NPCs, which is made totally obvious by the fact there’s no “talk to” or “ask about” verbs to choose from. For some reason this category has been getting either a 4 or a 6 every game so far and I’m going to break that pattern for this game as the dialogue is fairly limited when compared to the likes of Leisure Suit Larry and certainly not as clever, yet it’s not as simple or condescending as it was in some of the earlier games I played through. I’m going in between! I'm sorry to hear that. Unfortunately, I am completely unable to speak and so cannot comfort you in any way. That all works out to 62, which is 5 points higher than Leisure Suit Larry and the first game to earn Elaine Marley status. 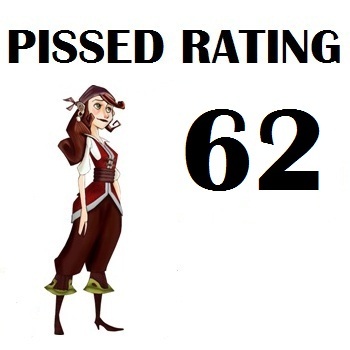 You probably haven’t noticed that there are different graphics that accompany the PISSED rating for each game as they’ve all been fairly bunched to this point, so I haven’t had the chance to bring many out (status’ range from LeChuck through to Guybrush Threepwood in case you’re wondering). I feel totally happy with the result, with Maniac Mansion clearly leading the pack, without causing great concern around the system coping with the inevitable future advancements. Now...what’s next? It looks to me like the circle on the easel is an unfinished painting of the meteor. Maybe the meteor got bored and rolled away leaving a trail of purple radioactive slime behind it. 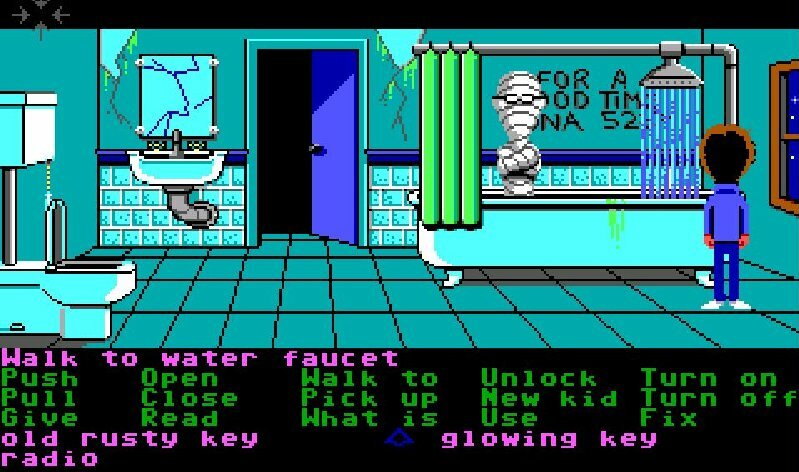 Did you actually find an english dos version of Mortville Manor? I searched for quite a while and came up empty handed. I guess if you're moving on to this one, does it mean you've managed to find an english version? I couldn't find one either. You'll see that the graphics of the original 1987 release were actually very plain in comparison. Not really much better than Leisure Suit Larry in my opinion. 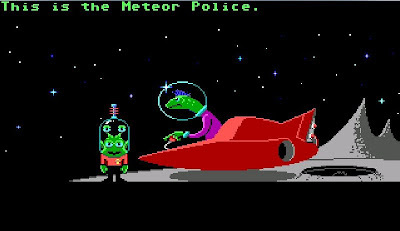 It would be more fair to compare the graphics of the enhanced version to other 1989 releases like Space Quest 3. That two years makes a huge difference. Yeah, that is kinda unfair to play the remake if you have a graphics category, isn't it? First of all, congratulations! That's another fine classic under the belt. Zak Mckraken also has an enhanced version. The first release for C64 and PC has very C64 style graphics, while the second version for PC has the Amiga/Atari ST graphics. There was a third, even more enhanced version for the FM Towns computer. The first thing to say is that both the original and the enhanced versions were released on the pc in 1988, not the years above. This raises an interesting question as to whether I should rate the graphics of the original or enhanced, despite the fact they were released in the same year. It's also worth pointing out that I played the 1987 enhanced versions of all the sierra games that came out prior to that year and while the graphics may not have been dramatically improved upon, who knows what I was unfairly judging. If I take the graphics from the original, the score would be adjusted to a 63. Thoughts? If that site is accurate, the original PC version was released in 1988 and looks pixel-by-pixel identical to the Commodore 64 version released the previous year. And the high-res version was released in 1989. Maybe I'm splitting hairs with this, but it is remarkable how much better the enhanced version looks compared to the original release. As a kid playing the Commodore 64 version, oh how I coveted those screen shots of the enhanced Amiga and PC versions! This is definitely a concern. Take for example the 4 games you played that used the CGA 4-color palette. They all got very low scores in the "Sound and Graphics" category. If you had played the Amiga versions of Uninvited and Tass Times, would the scores have been higher than 2 and 3? I think they would have. Also, two other categories in the rating system ("Interface and Inventory" and "Environment and Atmosphere") are going to be affected by the quality of the graphics to some extent. 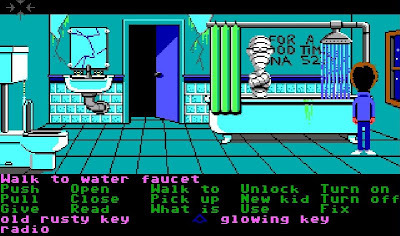 Another issue is that the games are listed alphabetically by year rather than chronologically, so Maniac Mansion got played before games that were released earlier. Of course, finding the exact release dates of all games on the list would be a monumental task that I don't think you or any readers would be willing to do. Then again, we are an obsessive bunch and it might make for an interesting community project. Going into the future (post Shadowgate), I don't really see any of this as a major problem though. The capabilities of the various hardware systems will converge, and the differences between versions in most cases will be minimal. Well, until you hit the modern age and HD remakes anyway: say, Ico vs Ico HD, or all the other HD remakes. Making good games is hard-- taking a good game and remaking it for a new system and people who missed the original is easy. Looks like a tough score to beat, but there's plenty of adventure gaming greatness to come! It's kinda hard for me to see a Lucasarts game at the top of the pile, since I'm still a big Sierra adventure game fan. It's something I may have to get used to though! I found a site whose adventure games list seems to be larger than yours (http://www.planete-aventure.net/). It's in French so I guess there's no way you'll use it, but it made me realize that there's at least one very interesting game that you would miss : Captain Blood (1988). I think that's a very weird but very pretty example of the "French touch". I thought we concluded that it never came out for PC? Or did I miss someone finding it? @Daubeur: yes, I'm aware that there are many, many more adventure games out there than are on my list. That's why I've decided to take every year as it comes and discuss the games I'm going to play with the readers prior to getting stuck into it. @Canageek: It definitely came out for the PC, we've just been unable to find the game in English. I have the game in French for the PC and I also have the game in English for the Amiga. I'm considering playing it through on the Amiga and playing a portion of it in French side by side to get a feel for the PC version (so I can rate the sound and graphics etc. properly). I just haven't had a chance to test both versions to make sure they actually work. Hopefully tonight! Really? I thought one site said it didn't come out in English for DOS and the one that did showed Amiga screenshots under the DOS heading, or did I misread the comment? Or dream it? @Canageek: I commented earlier that according to the HOTU entry for the game it had never been released in English for the PC, and that the screenshots passing as DOS on MobyGames looked Amiga/AtariST-ish. Unfortunately that's all we have to go by as we couldn't find any "official" answer or evidence as to the existence of the PC ENG version. Won't it be difficult if there are timing differences (NPCs walk around and are on a schedule)? So, the experience is different if Trickster goes slightly faster or slower, right? @Zenic: I don't think it's necessary for me to play the whole game through in French on the PC. The good thing about the game is that you seem to be able to access a lot of the house and outside areas without having to understand the language very much. I can therefore get a good feel for how the Sound and Graphics, Interface and Inventory, and Environment and Atmosphere categories should be judged for that version, while figuring out the rest (which appear to be exactly the same) on the Amiga. I spent 30 minutes making sure both versions work last night and while the graphics are definitely superior on the Amiga, everything else seems to be very similar. I'll write an intro to the game tonight and get stuck into it. The Cutting Room Floor is a wiki dedicated to finding and documenting game content that is created, and in the final version (or demos, or released source code, or anything else that the writers can get their hands on) but not accessible during the course of normal gameplay. Enter the command !a%ifyou*ve and press F7. Enter the command *ch4mysocks and press F7. Use the typewriter keys on the keyboard for entering *, not the key on the numeric keypad. " Man, that would have made your review a bit easier, wouldn't it Trickster? Uhhg, I finally finished this game and really didn't enjoy it at all. Way too many pixel hunts, which certainly wasn't helped by playing the non-enhanced version. Many of the puzzles felt like they were made unnecessarily hard for the sake of being hard. (Why is the tape hidden behind a panel in the library? No real thinking required, just more pixel hunting!) And the interface was slow and clunky to use, especially compared to its later incarnations. Backtracking and switching items between characters was also tedious as hell. I resorted to UHS after being stuck for a while, and after discovering that I missed about five important hotspots, that some of the solutions were simply stupid (Radioactive water to grow a plant, then give it a Pepsi? Work out so you can open the rusty grate? What?! ), and that half of the puzzles I focused on were actually red herrings, I just gave up and relied on the hints more than I really should have. Ron Gilbert found design notes for his old games. Here are his notes on Maniac Mansion. I started reading the blog some days ago (discovered months ago in Chet's blog) and I am reading all posts and comments to catch up with you all. I agree it is a great game and it was a huge leap in the adventure genre, but I think the puzzles and solvability score is a bit high. There are a couple of nasty dead ends that can leave you wandering around the mansion in desperation. I don't see that this was considered for the score. Just my five cents. Don't forget that he's rating the game as he experienced it. If he'd run into the dead ends, that would definitely have factored into his Puzzles and Solvability score, as it did in earlier games. Can someone please explain to me who the characters next to the Final Rating numbers are, what the thresholds are for getting different characters, and whether those thresholds have anything symbolic to do with their particular character? Good to know; thank you. I'd've thought a Yoda-type character would be a higher number than a random monkey? I am not sure since the monkey is probably from the later Monkey Islands that I haven't played. Perhaps it's meant to be the lovable sidekick? Loveable sidekick would make sense. Talks about SCUMMM, how Maniac Mansion was made, the first use of the word cutscenes in video games, deadends, how they refined the process of designing puzzles using a item dependency/flow chart (this is why Monkey Island has no dead-ends), and other tidbits.